After the Nikon Z, EOS R and Panasonic Lumix S, should Sony be worried…? 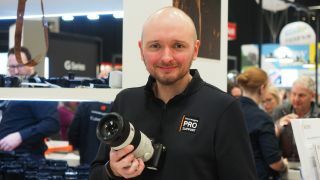 We caught up with Sam Pilling on the Sony stand at The Photography Show 2019 to find out what Sony thought about all its new rivals in the full frame mirrorless camera market. “We are clearly a generation ahead. Our A7 Mark II is about the same level as our rivals, we are now on generation III. We are market leading in combining silent shooting and autofocus in continuous operation. When the A9 launched we allowed people to start taking pictures they couldn’t capture before. No other camera on the market performs in the way the A9 performs, even now." Q: Is Sony still making the A7? Q: So it’s still a strong seller? “Why not go full frame mirrorless, when you can a full frame camera and 50mm lens for well under £1,000. Tomorrow we have a students day for fashion and photography students and the A7 is perfect." Q: Sony was pretty quiet last year when all this was going on. Isn’t that a bit worrying? Q: So you’re happy with the way things are going? So Sony seems pretty upbeat, despite all the attention-grabbing full frame mirrorless camera launches last year – and it's revealing nothing about any rumored new Sony A7000 model. And we have to say, the Sony stand was pretty rammed with visitors all through the four days of this year’s Photography Show. • Sony A7 III vs A7R III vs A7S II: How do they compare? • Sony A7 vs A7 II vs A7 III: How do they compare?